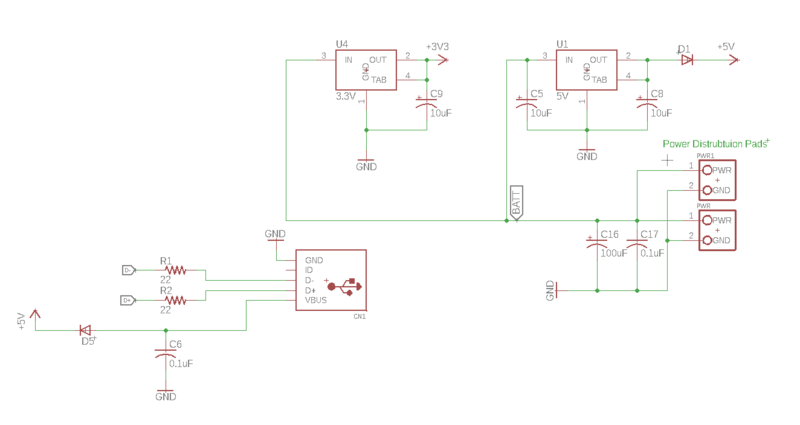 I have designed a simple PCB circuit board that is powered by either the 5V from a USB, or if a battery is plugged in, powered from a 3.3V and 5V regulator. I am no expert in electronics, but have attached my schematic below. I realized that if I remove and short D1 from the circuit and have it powered by USB, the 5V power from the USB will travel backwards through the 5V regulator and power the 3.3V regulator. (With no battery plugged in). The regulators I am using are the LM1085ISX and the data sheet is attached. Datasheet On page 12 of the datasheet it says that is has protection diodes that should prevent this reverse voltage, so I am a little confused as to why this is happening. I know this probably isn't the ideal situation, but is it okay to have this reverse voltage flowing through the regulator, could it possibly damage it? You're comparing applying and oranges, not the same function. What the datasheet is saying is that you don't need the diode shown in figure 14. Note that the diode shown bridges the input to output pin and isn't serving the same purpose as your D1 which is acting as an isolation diode, not protection. Read the second paragraph of 7.4.3 to understand the purpose of the protection diode. Put your D1 back in, use a Schottky type to lower the drop to 0.3 volts rather than the typical 0.7 volts of a standard silicon diode. Also, why 3 amp regulators? Seems out of place since USB can only supply 500ma. Thanks for the feedback! I went back and re-read the paragraph and I think I understand the purpose of the protection diode. So in this case, it would be okay to have voltage flow through the output to the input without damaging the voltage regulator? Also, why 3 amp regulators? Seems out of place since USB can only supply 500ma. When under USB power I only need to it power some small chips connected to 3.3V, but the PCB is for a drone which will be powered by a battery and powering a camera, transmitter, and a few other things that take a significant amount of power.